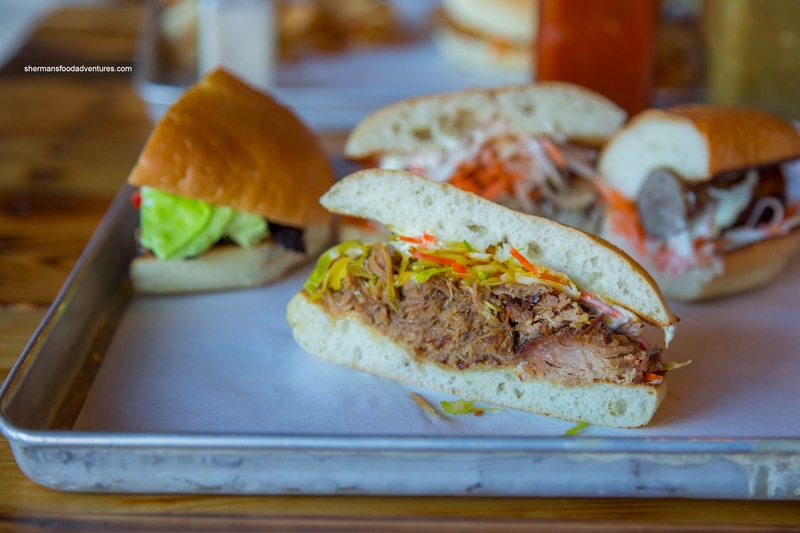 Sherman's Food Adventures: Smokehouse Sandwich Co.
Chinese food here, there and everywhere - that would probably describe the Richmond food scene in a nutshell. Illegal car maneuvers here, there and everywhere as well, but that is another story. So imagine my surprise when Choobee asked me to meet her for lunch at Smokehouse Sandwich Company. Yes, this place probably sounds like something that would be located on Main Street or Commerical Drive, yet it is located in Richmond. Having visited the place several times already, Choobee took over the ordering. We ended up sharing 4 sandwiches (yes, we pulled a Mijune) as well as some crisps. 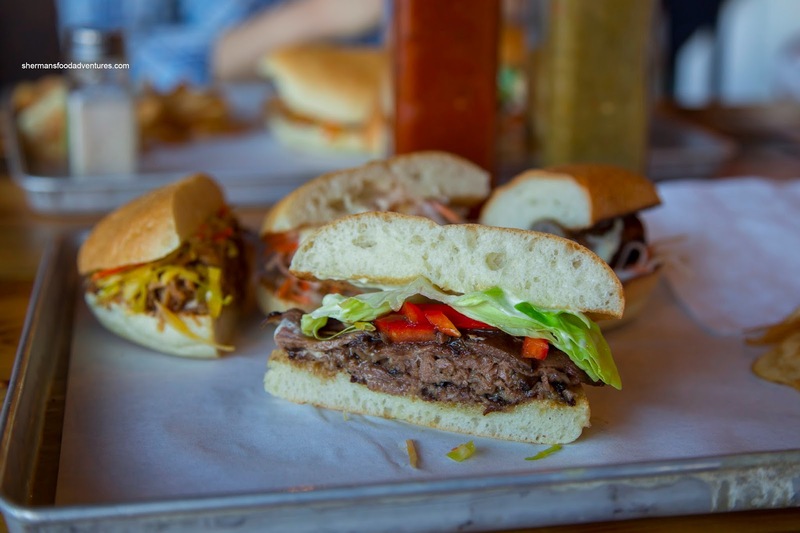 We gave their signature sammie a try first being the Samson consisting of coffee crushed, strawberry glazed beef brisket with butter leaf lettuce, red bell peppers and aioli. I liked the sweet, smoky bark that was an appealing chewy texture. The crunch of the sweet peppers combined with the aioli added the necessary moisture. However, the sammie could've used even bolder flavours. Next, we tried the Wilbur consisting of cumin spiced pulled pork with coleslaw. For me, I found the pork far too dry and stringy. It was smoky though and the cumin was unmistakable. I did like the crunch from the mild coleslaw though. 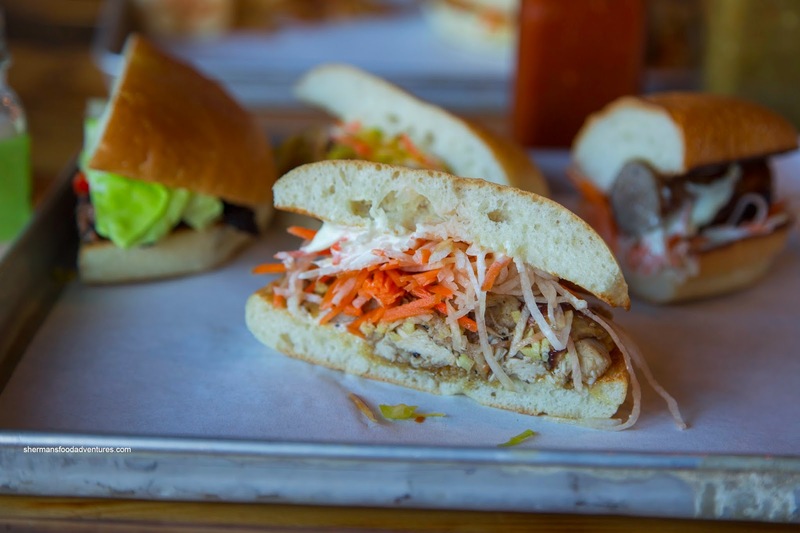 Heading onto our 3rd sammie, we had the Sarah made up of tamarind chicken with Asian slaw, sesame ginger oil and aioli. As much as there was tamarind, the dominant flavours were sesame and ginger as well as the garlicky aioli. Combined with the tart slaw, this was obviously Asian-tasting. I would've liked to see much more tamarind zip. 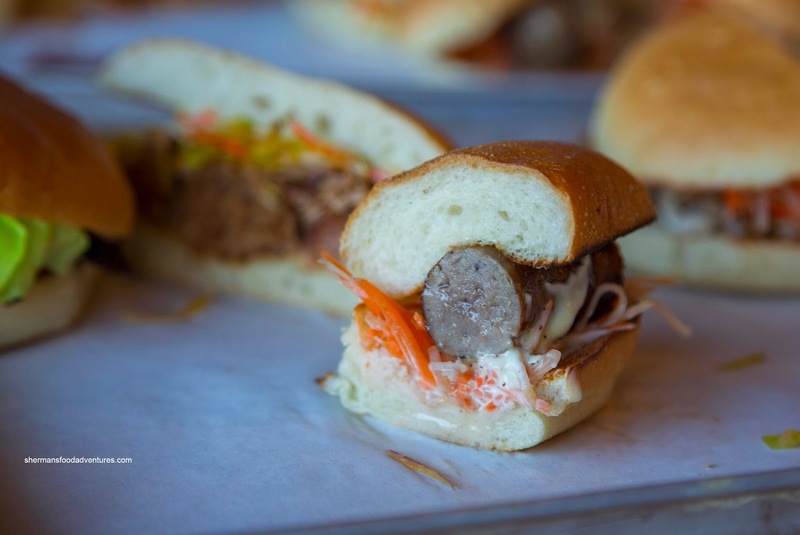 Lastly, we had the Jackie consisting of a sweet pork & 5-spice sausage with pickle Asian slaw & aioli. Once though the nice snap of the casing, the meat was moist and somewhat chunky. Naturally, it was sweet with the kick of 5-spice, in particular the star anise and fennel. I liked this "sandwich" but there could've been something more such as arugula or watercress to add some peppery-bitterness to counteract the sweetness. Of note, all of their sandwiches features Cobs bread. As mentioned, we had a side of Crisps as well. 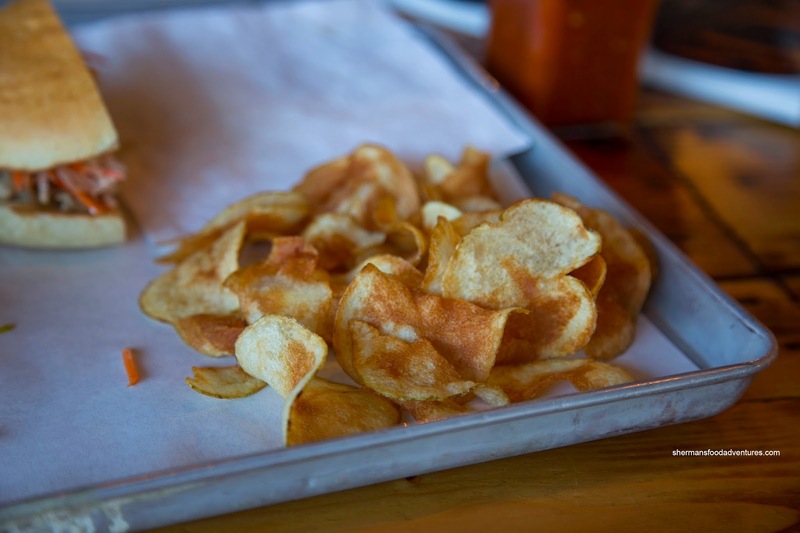 These razor-thin potatoes slices were super airy and as the name states - crispy. These were a good compliment to the sandwiches. And about those sammies, they were generally pretty good. One thing we would've liked to see was more bold flavours. Also, the portion size was somewhat small as we dusted off the 4 sammies with relative ease (basically 2 per person). 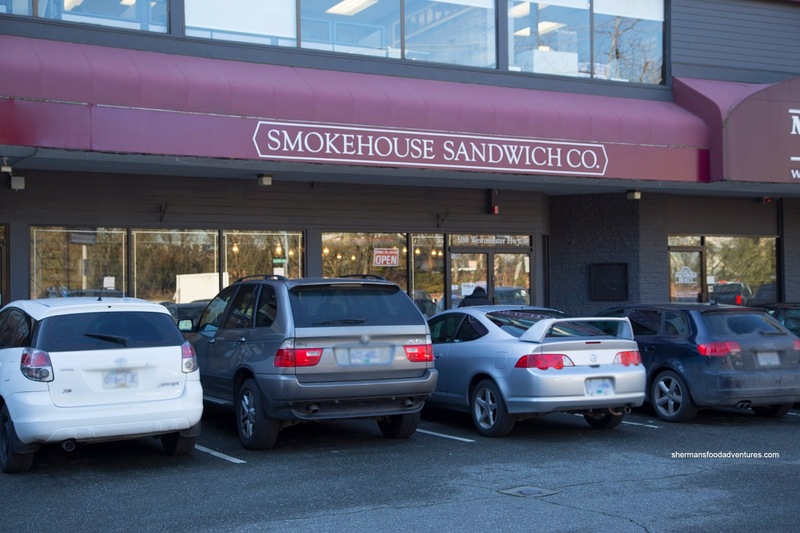 Otherwise, Smokehouse Sandwich Co. is a nice departure from the regular in Richmond. This is great! I can't wait to go there. I'm not that fussy of an eater so these sandwiches all look really delicious to me. Great place for lunch and a walk along the river afterwards. Thanks Sherman!